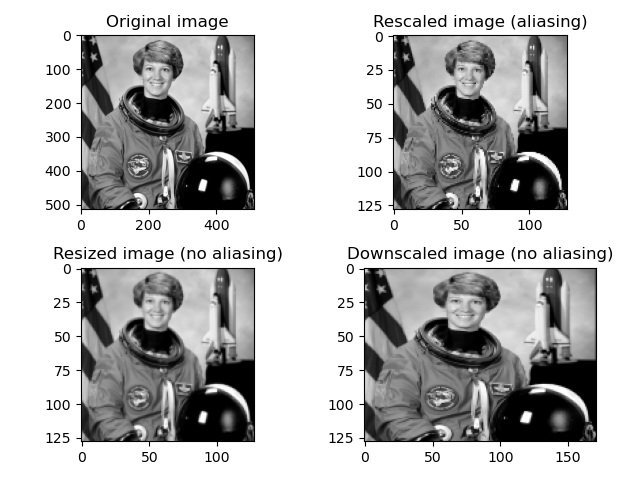 Rescale operation resizes an image by a given scaling factor. The scaling factor can either be a single floating point value, or multiple values - one along each axis. Resize serves the same purpose, but allows to specify an output image shape instead of a scaling factor. Note that when down-sampling an image, resize and rescale should perform Gaussian smoothing to avoid aliasing artifacts. See the anti_aliasing and anti_aliasing_sigma arguments to these functions. Downscale serves the purpose of down-sampling an n-dimensional image by integer factors using the local mean on the elements of each block of the size factors given as a parameter to the function.